The Vevey Folk Markets are held held exceptionally, in 2019, in Rue des Anciens Fossés in Tour-de-Peilz because of the Vintners’ Festival in Vevey, with a stunning view over Lake Geneva and the Alps. Every Saturday, locals and visitors to Vevey can enjoy UNESCO-listed Lavaux wines, typical dishes and traditional Swiss entertainment. The Vevey Folk Markets have been held each Saturday for more than 40 years. Every Saturday from the beginning of July to the end of August, Vevey locals, people from the region and tourists from all over flock to the Grenette covered market and the Hôtel-de-Ville. 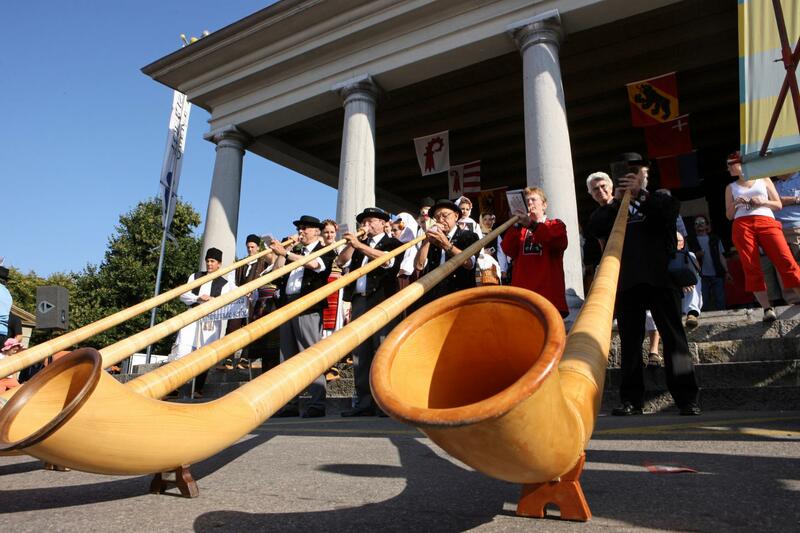 While sampling local produce, they enjoy the warm summer days and soak up the festive atmosphere of this market with its lively, colourful stalls and music bands, folk dancers and alphorn players. Buy a souvenir glass, with a different design every Saturday, enjoy the delicious local wines and meet the vintners of Lavaux and Chablais.